Sir Osmund Melbury is the patriach of the Melbury clan, all gathered together for a family Christmas in their vast country house. Let’s face it, you can probably guess what happens next… Yup, as Sir Osmund was rumoured to be changing his will, everyone has a motive for killing the old man in his study – but which of the vast clan of Melbury’s actually did it? 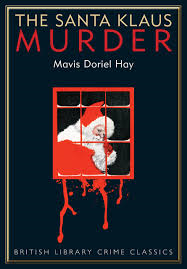 Written in 1936 by Mavis Doriel Hay (who wrote two other detective novels), The Santa Klaus Murder has been reprinted by the British Library who were nice enough to send me a copy to review. The last time they did that, Mr Balzagette’s Agent, the book was a fascinating insight into the writing of the time but was, let’s face it, a rubbish mystery. I think subconsciously, this is why I’ve been putting off reading this one. But it’s all done and dusted in time for Christmas – so what did I think of this one? To be fair, Mr Balzagette’s Agent was fron 1888, while this is from 1936 and the Golden Age of detective fiction was well underway – Dame Agatha had been writing for a decade and a half by this point – and the style of the detective novel was already defined in the form that we know it – namely, a murder happens, a finite list of characters are suspected, a detective sifts the clues and the murderer is unmasked in the final chapter. To Hay’s credit, she tries something a little different – the book starts with various characters accounts of the build-up to the case before Colonel Halstock takes over the investigation. These opening excerpts take a little while to get through and, as they are explained as witness statements that are later requested by the Colonel, I wonder if the structure of the narrative would have been improved if it had started with the murder and these chapters were included at the point the Colonel requests them as flashbacks. Either way, I did feel that Hay didn’t really have the feel of different voices for the different narrators and the overall feel of the book is that it is fairly dry. The list of suspects is perhaps too long as well – I’m not sure I’ve ever checked the list of dramatis personae as much as in this novel. But the mystery is well constructed, with a vast array of clues pointing at the murderer. Oddly, the solution reminds me of another Golden Age novel that I read fairly recently, but I cannot recall which one it was – not that I’d tell you, in case you’ve read one and not the other. But anyone who knows what I mean, do let me know. Overall then, it requires a little sticking power to get through the opening sections, but this is a well-constructed murder mystery from a long forgotten author and well worth a look. Recommended for the classicists out there. Thanks for the warning about the slow opening as that might have stopped me frankly! Though this is well clued and a fair play mystery, I found it a bit of a drag.There is a lot of padding which slows down the pace. The book could easily be shortened by 50 pages. Always glad to see it when you review a book I am thinking of purchasing. This leaves me on the fence. The book may be interesting enough as a vintage mystery read, with a Christmas theme. But not a great read overall. I will probably get around to it some day. Thanks for the review. Have a wonderful Christmas and New Year’s Day. To be honest, while I respect it as a mystery, not sure I really enjoyed it. The similarity of yhe motive to the book that I can’t remember didn’t help. Well, I have to disagree with you about the voices of the narrators and about your other remark about the slow start. The voices are very distinctive — especially the gossipy aunt who was sort of the Drusilla Clack of the book. I liked it a lot. Also worth mentioning is Hay’s criticism of the treatment of WWI veterans and the sympathetic portrait of the war vet’s wife who I thought was the most interesting of the women characters. This book reminded me a lot of Trent’s Last Case in which the suspects protect each other thinking someone is guilty but without ever really knowing the truth about the crime until the end. It’s a very good example of the fair play detective novel. You’re probably right about it appealing to classicists rather than readers who are used to contemporary crime novels. Certainly an improvement over her other two books. As to the similar ending — I can think of several books that have both a similar motive and killer but I don’t think I ought to mention any of them.